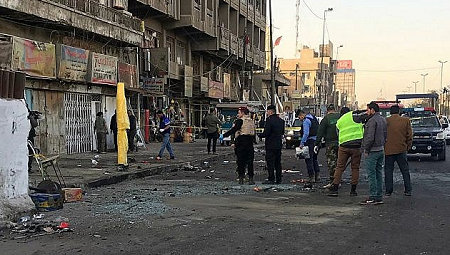 Twin suicide bombings rocked Baghdad today, killing 38 people in the deadliest attack since Iraq declared victory over the Islamic State group last month, and raising fears ahead of national elections planned for May. The bombers targeted the bustling Tayran Square, in the heart of the capital, setting off their explosive vests among laborers and street vendors during the morning rush hour. More than 100 people were wounded, according to police and hospital officials, who spoke on condition of anonymity because they were not authorized to talk to the media. No one has claimed the attacks, but they bore the hallmarks of IS. Iraqi forces have driven IS from all the territory the extremists once held, but the militant group has proven resilient in the past and is likely to continue carrying out insurgent-style attacks. Ambulances rushed to the scene as security forces sealed off the area with yellow tape. Slippers could be seen scattered about on the blood-stained pavement as cleaners hurried to clear the debris. "It was tremendous, I felt the ground shaking under my feet," said Munthir Falah, a secondhand clothes vendor whose chest and right leg were pierced by shrapnel. He said he fell to the ground and lost consciousness before later waking up in a hospital. The father of three said government forces had failed to secure the capital. "They think that Daesh is done," he said, referring to IS by an Arabic acronym. "They don't bother themselves to exert efforts to secure Baghdad." Einas Khalil, a Baghdad housewife, blamed the security breakdown on the country's feuding politicians, many of whom are connected to different state-sanctioned militias or branches of the security forces.